Future technologies based on the principles of quantum mechanics could revolutionize information technology. But to realize the devices of tomorrow, today's physicists must develop precise and reliable platforms to trap and manipulate quantum-mechanical particles. In a paper published Feb. 25 in the journal Nature, a team of physicists from the University of Washington, the University of Hong Kong, the Oak Ridge National Laboratory and the University of Tennessee, report that they have developed a new system to trap individual excitons. These are bound pairs of electrons and their associated positive charges, known as holes, which can be produced when semiconductors absorb light. Excitons are promising candidates for developing new quantum technologies that could revolutionize the computation and communications fields. The team, led by Xiaodong Xu, the UW's Boeing Distinguished Professor of both physics and materials science and engineering, worked with two single-layered 2-D semiconductors, molybdenum diselenide and tungsten diselenide, which have similar honeycomb-like arrangements of atoms in a single plane. When the researchers placed these 2-D materials together, a small twist between the two layers created a "superlattice" structure known as a moiré pattern—a periodic geometric pattern when viewed from above. 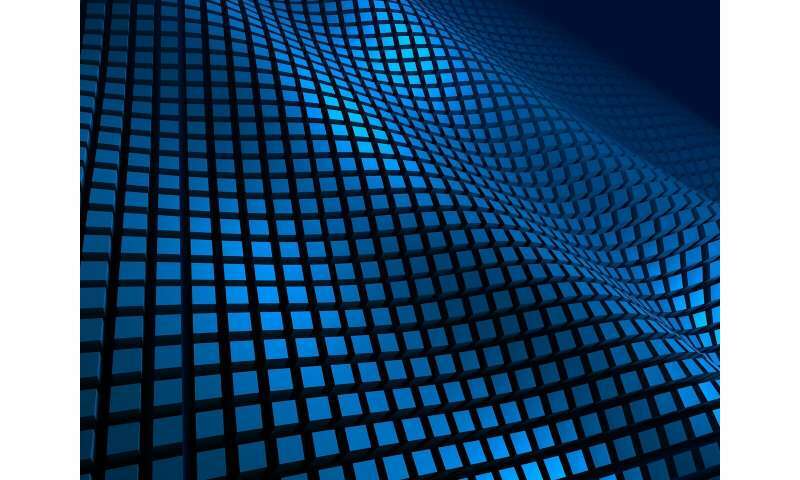 The researchers found that, at temperatures just a few degrees above absolute zero, this moiré pattern created a nanoscale-level textured landscape, similar to the dimples on the surface of a golf ball, which can trap excitons in place like eggs in an egg carton. Their system could form the basis of a novel experimental platform for monitoring excitons with precision and potentially developing new quantum technologies, said Xu, who is also a faculty researcher with the UW's Clean Energy Institute. Excitons are exciting candidates for communication and computer technologies because they interact with photons—single packets, or quanta, of light—in ways that change both exciton and photon properties. An exciton can be produced when a semiconductor absorbs a photon. The exciton also can later transform back into a photon. But when an exciton is first produced, it can inherit some specific properties from the individual photon, such as spin. These properties can then be manipulated by researchers, such as changing the spin direction with a magnetic field. When the exciton again becomes a photon, the photon retains information about how the exciton properties changed over its short life—typically, about a hundred nanoseconds for these excitons—in the semiconductor. In order to utilize individual excitons' "information-recording" properties in any technological application, researchers need a system to trap single excitons. The moiré pattern achieves this requirement. Without it, the tiny excitons, which are thought to be less than 2 nanometers in diameter, could diffuse anywhere in the sample—making it impossible to track individual excitons and the information they possess. While scientists had previously developed complex and sensitive approaches to trap several excitons close to one another, the moiré pattern developed by the UW-led team is essentially a naturally formed 2-D array that can trap hundreds of excitons, if not more, with each acting as a quantum dot, a first in quantum physics. A unique and groundbreaking feature of this system is that the properties of these traps, and thus the excitons, can be controlled by a twist. When the researchers changed the rotation angle between the two different 2-D semiconductors, they observed different optical properties in excitons. For example, excitons in samples with twist angles of zero and 60 degrees displayed strikingly different magnetic moments, as well as different helicities of polarized light emission. After examining multiple samples, the researchers were able to identify these twist angle variations as "fingerprints" of excitons trapped in a moiré pattern. In the future, the researchers hope to systematically study the effects of small twist angle variations, which can finely tune the spacing between the exciton traps—the egg carton dimples. Scientists could set the moiré pattern wavelength large enough to probe excitons in isolation or small enough that excitons are placed closely together and could "talk" to one another. This first-of-its-kind level of precision may let scientists probe the quantum-mechanical properties of excitons as they interact, which could foster the development of groundbreaking technologies, said Xu. "In principle, these moiré potentials could function as arrays of homogenous quantum dots," said Xu. "This artificial quantum platform is a very exciting system for exerting precision control over excitons—with engineered interaction effects and possible topological properties, which could lead to new types of devices based on the new physics." "The future is very rosy," Xu added.